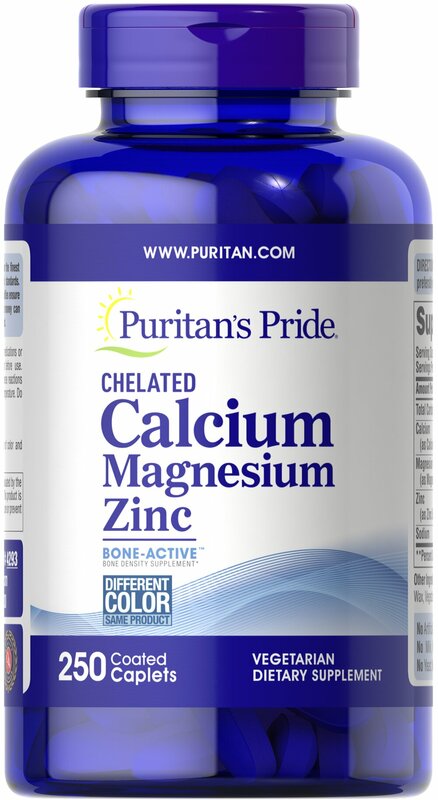 Puritan's Pride offers a high quality Calcium / Magnesium / Zinc supplement that delivers 1000 mg Calcium, 400 mg Magnesium and 25 mg Zinc in one convenient form for optimal nutritional support. Calcium is the primary mineral responsible for strong bones. ** The body cannot produce calcium, so proper amounts must be ingested in order to provide the body with this essential nutrient. Calcium and magnesium play roles in proper bone mineralization, muscle contractions and nerve impulses. ** Zinc helps support immune function and plays a role in over 300 enzymes in the body. ** Adults can take three caplets daily with a meal.